ATG&D Dream Home | We Live Here Now! I say “we moved in!” versus “we’re all moved in!” because while technically all of our things are out of storage and within the parameters of the shingles and siding you see below, the reality is I just had to climb over fifty-eleven-hundred boxes to reach my desk and laptop. In fact, as I write this from my overly-thought-out dream office complete with overlooking 2nd story balcony, my view is less “family, living room, kitchen, zen” and more “U-Haul, Staples, Zappos, Keurig, Canadian Mist, Wildtree, and Ale Asylum” ads on cardboard marked up with black Sharpies. But we’re in! We live here now! 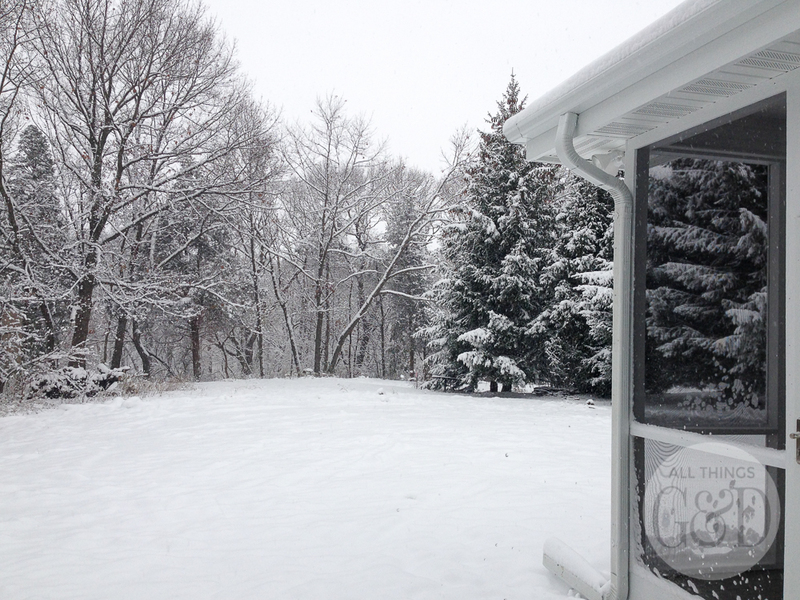 We moved in on the one and only day in November that it decided to snow – and not just a little bit. Our forecast was calling for 10 inches of snow, but thankfully we only got about half of that and it all ended up being pretty manageable. G and his buddies loaded and unloaded the U-Haul while Kate rediscovered her Legos and I manned a shovel, trying to keep our driveway as clear as possible so our moving truck wouldn’t go careening into our neighbor’s house. Unpacking is happening slowly and I’m beginning to convince myself that cardboard may be the new reclaimed wood (who’s with me?). On the construction side, the house is almost completed (the front door and sidelights still need to be painted black and there are some little things left to do inside), and G and I are skin-pinching, chest-bumping, and all-around overjoyed with how everything turned out. I’m so happy you’re finally in your dream home!! Can’t wait to see pictures!! Thank you so much, Ariadna! My hope is that by the time I’ve gotten you all caught up on our construction process I will be unpacked and have some nice interior pics to share. Fingers crossed. I can’t wait to show you more! Congrats Dusty! I have been eagerly awaiting updates. Can’t wait to see pictures. Enjoy this beautiful home…such a wonderful Christmas gift. Thank you so much, Pam! We are so happy to be in before the holidays. Kate and I put the tree up last Sunday (in our empty dining room, haha) and it feels even more like home. Merry Christmas to you and your family! You’re dream home is gorgeous! Can’t wait to see the inside when you are “All Moved In”. I’m sure it’ll be stunning! Congratulations…genuinely happy for you and your family! Your dream home is gorgeous…not You’re! got carried away being so exited! hehe. Thank you so much, Sonia – truly so sweet of you to say! Dusty… I’m dying to see the inside!! I’m sure it’s just brilliant!! So happy for you and your family! Thank you so much, Kristin! I’m dying to share it with you!! It still looks like a disaster zone around here, but we’re having a little housewarming party this weekend so I’m scrambling to get all these boxes unpacked and rooms at least semi-pulled together before then. Eek! 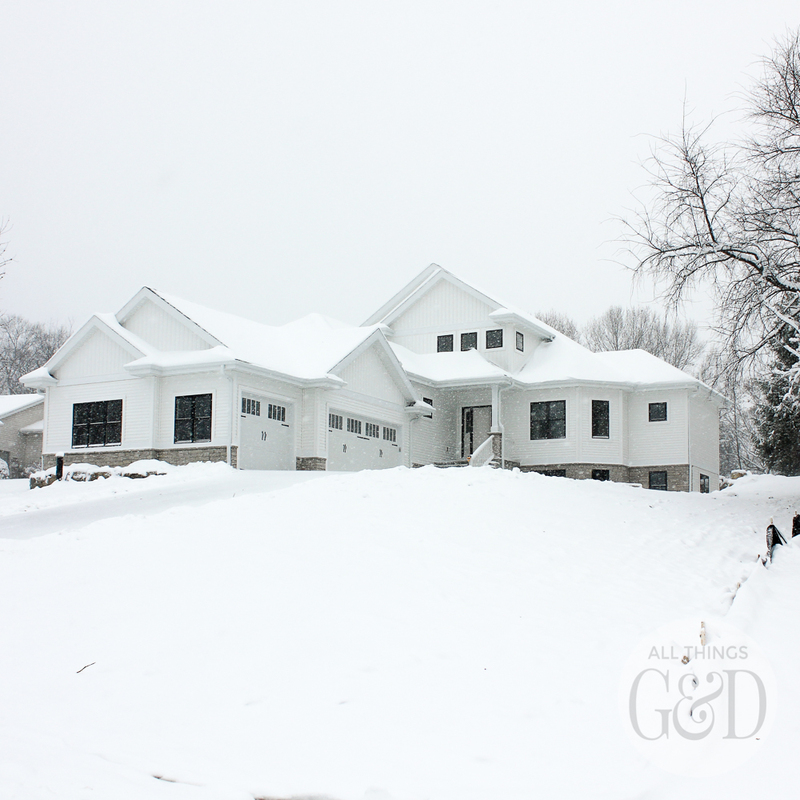 Congratulations, I think the snowy day seems quite appropriate for moving into you new bright white home! Thank you so much, Jennifer! The snow made everything look so darn beautiful. Sadly it’s all melted now and we’re staring at a yard full of mud (construction wasn’t completed in time to seed this fall, so we need to wait until spring now). I’m hoping it snows again soon so I have a pretty yard to look at again! All that snow just adds more beauty to your home!!! Thank you so much, Debbie! Our home was made for winters in Wisconsin. Cant’ wait to share the inside with you! Congrats!!!! I can’t wait to see the inside! Thank you so much, Anna! I’m so excited to get settled and share it with you all. Hopefully soon! It looks beautiful! The snow adds a lovely touch. Thank you so much, AK! So exciting! I can’t wait to see the big reveal of how amazing your family will decorate your new dream home. Iseriously cannot wait to see the pictures – I’m dying in anticipation. But fine, I’ll let you find your toothbrush first.